Another fine German bushing going bad ,,,,if you have been around German car for a long time,,,,you would understand about their suspension bushings going bad after a period of time,,,,this is the rear differential bushing on a F10 or F2 they are the same,,,,,you can see how the bushing is cracked. This is a picture of the rear subframe,,,here I am pulling the bushing out of the rear subframe with a special tool. And this is me pulling the bushing out the other side,,,you have to drop the exhaust system and lower the rear differential to get this bushing out,,,once you pull the old bushing out,,,then we use the same tool and push the new bushing back into the rear subframe,,,,these bushing are a common thing to crack,,,there are no signs while driving that the bushing is cracked. 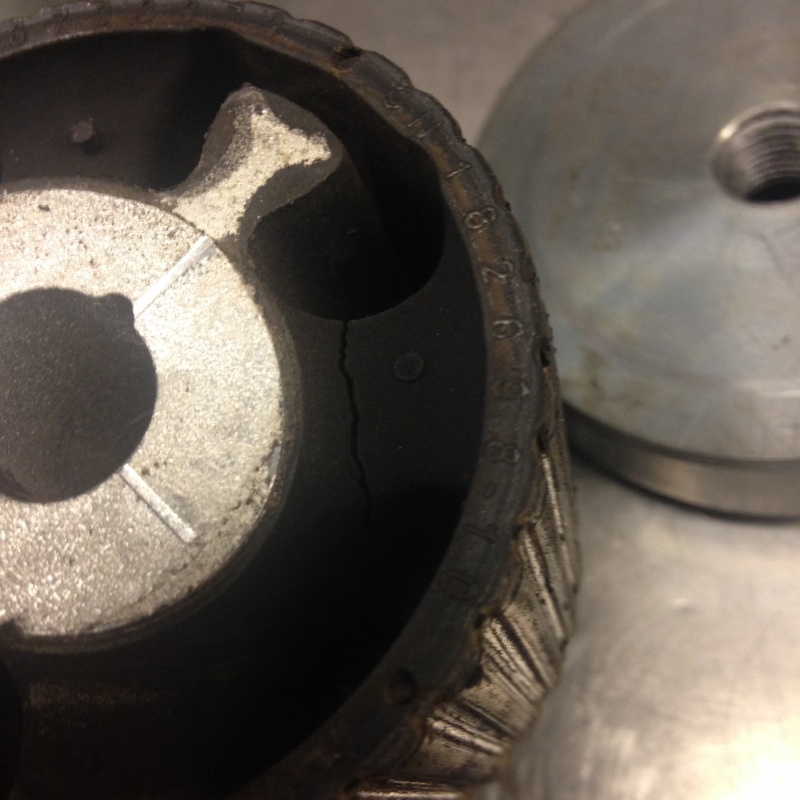 This entry was posted in Uncategorized and tagged bushing, cracked, F02, F10, Rear differential. Bookmark the permalink. How much would an independent shop charge to replace? The DEALER good guy price was $750. 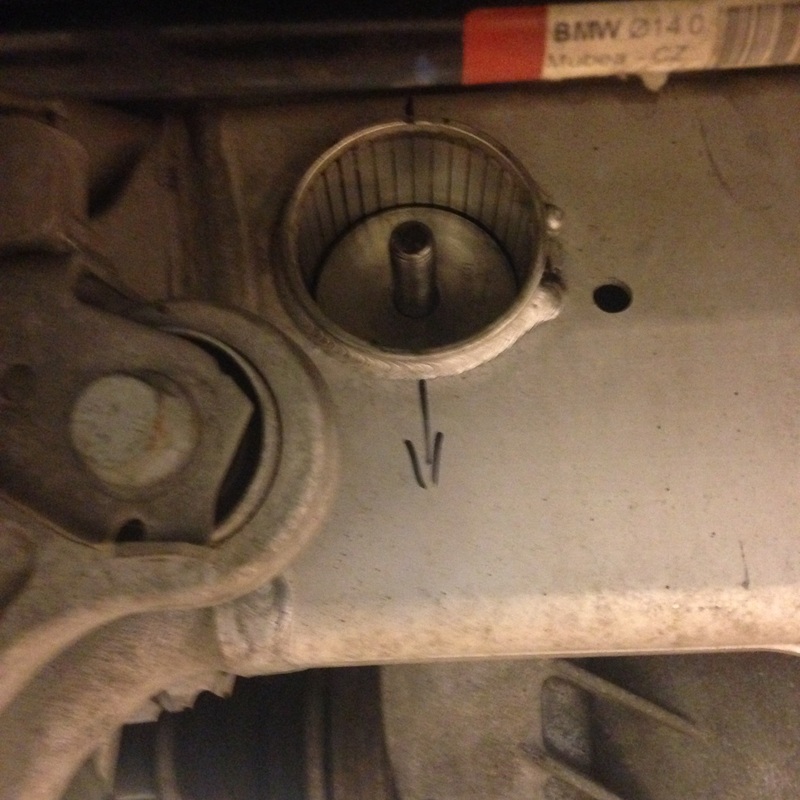 Have you ever found the two nuts on the rear diff ears (and exhaust hangers) to loosen themselves? Just bought a used 550GT and they were both almost off the bolt loose. No I haven’t seen them loose,,,are you sure someone hasn’t been under the car doing any repairs. So looking at this it seems that you drop the exhaust and then unbolt the diff just lowering it enough to get the tool in place. Is that it or do you need to drop the drive shaft and pull axles etc.? Yes you drop the exhaust and just unbolt the rear diff and lower it,,,,the rear diff isn’t going anywhere with the axles still connected to the diff,,,,,you should have just enough room to replace the bushing,,,,do not disconnect the driveshaft. Thanks, I have to replace the rear bushing soon on my 2011 550i. I just noticed just one crack on the F10 535i. Don’t notice any signs or symptoms aside from the crack. Should I leave it or wait until more sections crack? It sounds like dealers don’t recommend replacment until 2 or more ribs have cracked. I would wait until the other side cracks,,,,the cracks should go all the way though the bushing then replace. 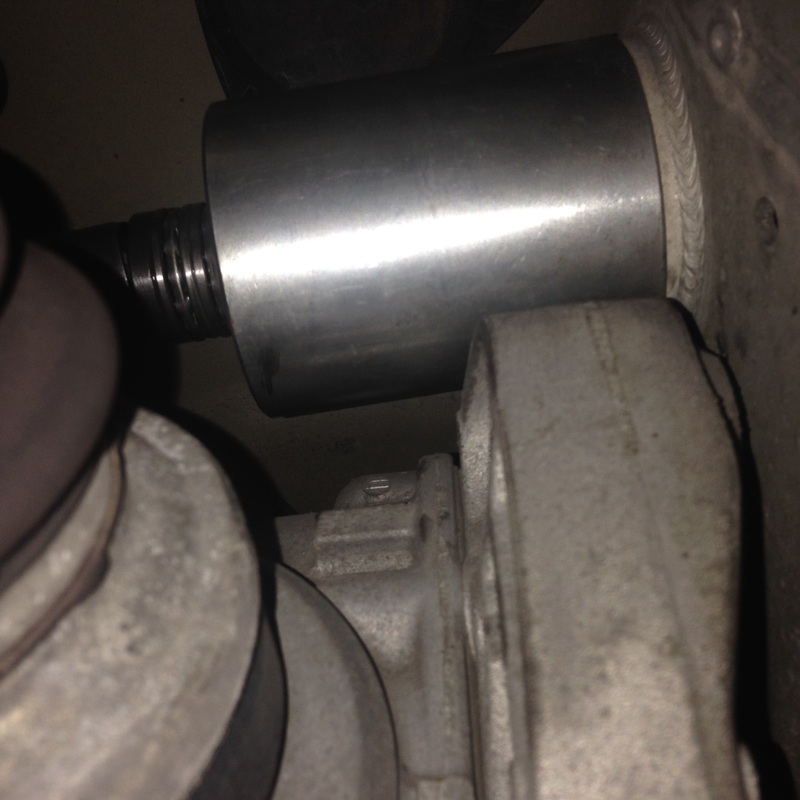 Where can I buy the tool to press out and in the bushing??Thanks? ?any tool number?? I got mine online for about $120 just be sure it is the one for the correct bushing as per the diagram. The part number on my kit is BMA1568 from German Specialty Tools but there are different vendors. It’s very tight to do in the car and if you have the rear steering like mine, it requires moving that. I believe that required a E16 or 18 inverted torx socket if I recall and a lot of different tools to get in where I needed to a turn at a time. Thanks for the helpful info. I’m thinking about installing an Msport exhaust and wondering if removing the stock mufflers would provide enough “give” to complete the bashing replacement without dropping the entire exhaust system. Any thoughts? I managed to get mine done by dropping the exhaust without removing it. It’s a pain but it worked for me. Of course mine is a 550i so a 535i might be different.